Technology is an every changing landscape. In today's connected world, a client-centric organization needs to stay close to the leading edge of the technology curve to maintain market competitiveness and meet clients' expectations. When an organization adapts a new technology, their internal IT staff learns the new technology on-the-job. The risk associated with this endeavor is high due to several factors such as workers' learning curves and overall employee turnover. Paradigm makes tremendous investments in new technologies through dedicating teams to research new technologies to adopt them into our mature and proven processes. When clients partner with Paradigm to develop new technology initiatives or application developments, it is likely that we already have developed practices and processes suitable for that technology. In doing so, we enable clients to maintain high levels of technology advancement. Application development at Paradigm helps organizations be future-oriented and competitive in their business while at the same time being cost effective by fine-tuning their business critical applications. Our matured application development process consists of complete Software Development Life Cycle that includes Requirement Analysis, Architecture and Design, Build and Unit Testing, and System and Integration Testing of the application. Our expertise in methodologies like Waterfall, RUP, Iterative, Agile and Extreme; and architectures like Service Oriented Architecture and Web Services results in cost-effective solutions with quick turnaround. 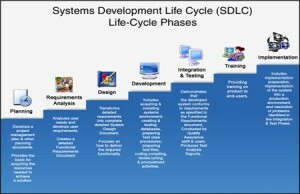 We have defined metrics to measure the status of each SDLC phase. Through our experience in developing of new technology-based Applications, we reduce risk for our clients in their new business critical endeavors. Ability to deliver all life cycle stages. Development using all technologies - legacy to web. Multiple paradigms (structured, OO) and project sizes. Reduced risk in introducing new technology through our staff's prior experience in the technology and tool set. Ready to roll best practices. Increased ROI (Return on Investment) from new technology. © 2019 Paradigm Infotech. All Rights Reserved.